The amazing life story of legendary New York stylist and personal shopper Betty Halbreich, the inspiration for a forthcoming HBO television series in development by Lena Dunham. Betty Halbreich is Director of Solutions at New York luxury store Bergdorf Goodman. The legendary personal shopper, who has been impeccably dressing her clients for forty years and herself for eighty-six, has featured in the New Yorker and in the documentary film Scatter My Ashes at Bergdorf's, and regularly dispenses her unique brand of wit and style in a range of outlets, including the Wall Street Journal. 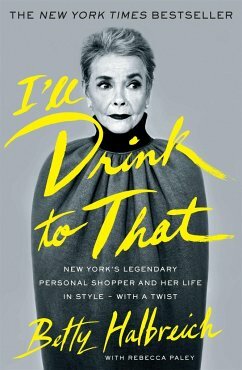 She is the author of Secrets of a Fashion Therapist and her memoir, I'll Drink to That. She is also the inspiration for a forthcoming HBO television series written by Lena Dunham.